Every culture has its own myths, and this lively and accessible compendium gathers some of humankind’s most enduring stories in one place. 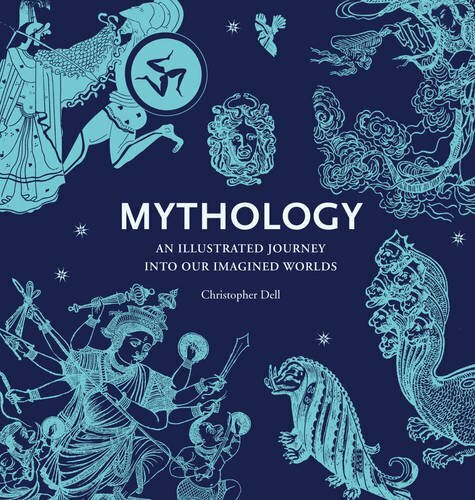 Mythology: An Illustrated Journey into Our Imagined Worlds, by Christopher Dell, is an attractive guide to the world’s mythologies and folklore. With 410 illustrations, Mythology is, in all probability, the most visually appealing publication on mythology. This is familiar territory for Dell, who holds a degree in the History of Art from the Courtauld Institute, London. He has written and edited several books on art and visual culture, including What Makes a Masterpiece and Monsters: A Bestiary of the Bizarre; Mythology is his best work yet. Dell’s scope is cast wide as he surveys the world’s major mythological traditions. Celtic, Greco-Roman, Norse, Buddhist, East Asian, Native American, Central and South American, Near Eastern, and African traditions are all thoughtfully compared and explored. This is certainly a fine introductory book to those interested various mythological stories. While Dell’s examination of myths seems driven by the question of what makes myths an object of fascination, it should be noted that some chapters are stronger and better written than others. I was surprised and dismayed to find no East Asian or South Asian heroes appeared in the “Heroes” chapter. (All were “western” save, perhaps, Gilgamesh.) The same is true of the “Quests Journeys, and Epics” chapter. (China’s beloved Journey to the West is the sole exception.) Despite these minor foibles, Mythology is accessible, fair in its comparisons, and offers the reader curious little anecdotes. Ancient History Encyclopedia recommends his book to those interested in mythology, folklore, religious studies, and world literature. Upper level and high school teachers may find this book especially handy in creating handouts to students in social studies and literature. Dell, Christopher. "Mythology: An Illustrated Journey Into Our Imagined Worlds." Ancient History Encyclopedia. Last modified July 15, 2016. https://www.ancient.eu/review/142/. Dell, Christopher. "Mythology: An Illustrated Journey Into Our Imagined Worlds." Ancient History Encyclopedia. Ancient History Encyclopedia, 15 Jul 2016. Web. 18 Apr 2019.